Heat oven to 400 degrees and line a cookie sheet with parchment paper. In small bowl mix together the mashed potato, egg, and milk. Set aside. Put dry ingredients in your food processor and pulse to combine well. Add the butter in pieces and pulse until the mixture comes together in crumbs. TIP: If you don’t have a food processor, you can get the same effect with a whisk and a pastry hand blender. With the added bonus that you will also burn a few calories! Add the wet ingredients and pulse just until the mixture comes together in a soft dough. Place dough on a lightly floured counter top (or on a piece of parchment) and gently yet quickly work in the cheese (if using). Now pat into a disk that is about 3/4 of an inch thick. Using a round cookie cutter, cut out as many biscuits as possible. Remove biscuits to cookie sheet. Now, rework the leftover dough into another disk about 3/4 of an inch thick and cut out as many biscuits as possible. Repeat until you are out of dough. Bake until golden brown – 15 to 20 minutes. Serve warm. TIP: You can also use any leftover dough to make “biscuit holes” – a gfandme.com take on doughnut holes. Roll the leftover dough into small balls and then roll these in a mixture of sugar and cinnamon. Bake in a 400 degree oven for 8 – 10 minutes and enjoy warm. Makes a great dessert! 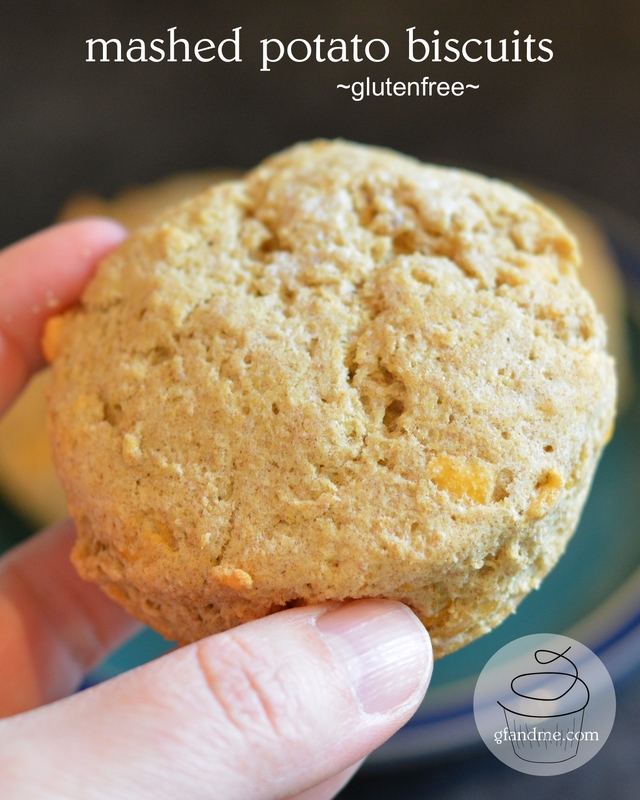 This entry was posted in Baking, Breakfast & Brunch, Lunch and Dinner, Recipes and tagged bread, food processor, gluten free, mashed potatoes, quick and easy, teff flour. Bookmark the permalink. They look delicious, I gather corn starch is what we call cornflour? I am going to go with that assumption! Here corn starch is very white and fine (like tapioca starch) and corn flour is heavier and more yellow. Let me know how they turn out if you get a chance to make them. Thanks Gfandme, our cornflour is quite white and fine so I think it’s the same as corn starch. I will!